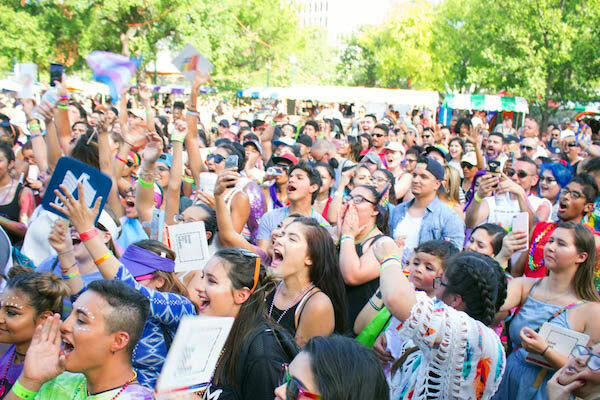 Organizers at Pride San Antonio have announced an all-star lineup of performers for the Pride Bigger Than Texas Festival on June 30 in Crockett Park. Three of the acts on the slate are veterans of The Voice, NBC’s singing competition. Earlier this year, Angel Bonilla became the first transgender contestant on The Voice. She is originally from Laguna, Philippines and currently lives in Los Angeles where she pursues her singing career. “As early as five years old, I already knew that I am a girl trapped in a boy’s body,” she told host Carson Daly during her first appearance on the show. “Growing up in a very conservative family, it was very difficult for my father.” Bonilla was eliminated from the competition before the finals but continues performing around the country. Bidi Bidi Banda, Austin’s all-star Selena tribute band, is making its second appearance at the Pride SA festival. The band is fronted by Stephanie Bergara, who has Selena’s name tattooed across her forearm in red. Bidi Bidi Banda’s interpretation of Selena’s greatest hits has propelled it into national prominence with the group now performing across the country at gigs like Mandalay Bay House of Blues in Las Vegas, Slim’s in San Francisco and Union Club in Los Angeles. The drag queen trio known as Stephanie’s Child features the voices of Jan Sport, Lagoona Bloo, and Rosé. The three were the featured on The Voice opposite Jessie J on the season 13 finale. Winner of “Best Cabaret” and nominated for “Best Group” at the 2017 NY Nightlife Awards, the group performed the National Anthem at the 2017 LGBT Winter Gala, honoring Betty Buckley; and at the Dream Hotel New Year’s Eve party. Each member of Stephanie’s Child is a celebrity in their own right. Jan Sport was named one of the “Insanely Beautiful Drag Queens You’ll Wanna Follow On Instagram” by Buzzfeed. Lagoona Bloo was nominated for Best Vocalist at the 2017 NY Nightlife Awards. Rosé – a recent winner of Lady Liberty, New York’s largest drag competition – was called “a razor-tongued tigress with slayage in her blood” by Out.com. When Chris Weaver took the stage for a blind audition on The Voice, the judges had no idea what he was about to unleash. Weaver, who performs in New York as Nedra Belle, took the judges by storm as he let loose with a soulful rendition of “Try A Little Tenderness.” Weaver, who performed on the The Voice as himself, was eliminated during the playoff rounds. However he was asked to return to perform in the show’s finale last December where he performed “Bang Bang” as Nedra Belle. Comedienne Sandra Valls, a native of Laredo, Texas, who now lives in Los Angeles, has been featured in two Showtime specials, The Latin Divas of Comedy, and Pride: The Gay and Lesbian Comedy Slam. Curve Magazine has boasted that Valls is “one of the top badass comics to watch for.” Valls makes frequent appearances in San Antonio where she has performed as part of the Queer Queens of Comedy Tour. Pride Bigger Than Texas Festival Presented by USAA and Bud Light, June 30 from 11 a.m. to 7 p.m., Crockett Park, 1300 N Main Ave. Admission $10. More information at this link.